Salt and pepper: These are probably the spices that every person worldwide knows and eats almost daily in their meals. In the well-assorted spice trade you will find different varieties: green, black, white or red pepper. 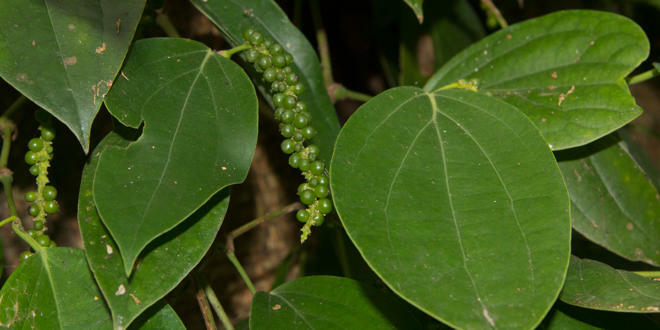 But only one single plant produces this variety of real pepper: the black pepper (Piper nigrum). The name is admittedly somewhat misleading. 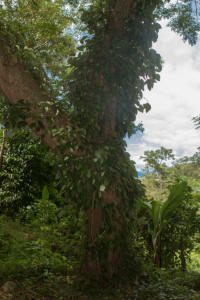 It is a climbing plant that climbs along high trees towards the sky and grows up to 15 metres long. The pepper plant originates from India, more precisely from the pepper coast in the southwest of the country, directly on the Arabian Ocean. From there it arrived many hundreds of years ago in Indonesia, Malaysia and finally all over the world with the seafarers. Pepper probably came to Madagascar with the Europeans in the 17th century. Merchants and pirates used the ports of Nosy Boraha (St. Marie) and Toamasina (Tamatave) as bases for their trade routes. Pepper was very valuable at that time and was a popular commodity for trade as well as stolen good. 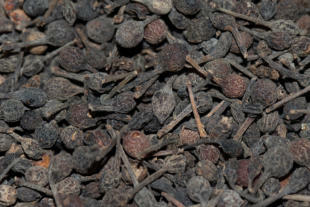 Black pepper is cultivated in Madagascar in plantations cared for by small farmers. 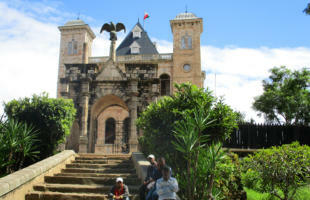 Most of them are located along the river Sambirano in the northwest of the island, in the regions Sofia, Diana and Sava. The climbing plants are, as far as possible, pruned to a height of three to four metres for easier harvesting. This works best when the pepper tendrils grow up on coffee or cocoa trees, so that the farmers have a mixed plantation with several uses. Mango and tamarind trees are also popular, but sometimes huge climbing aids for pepper plants. In Madagascar, black pepper blooms only once a year in most locations. However, the flowers are so small that they would hardly catch a traveller’s eye. 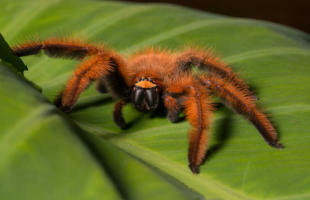 The pollination is done by insects that fly from flower to flower. 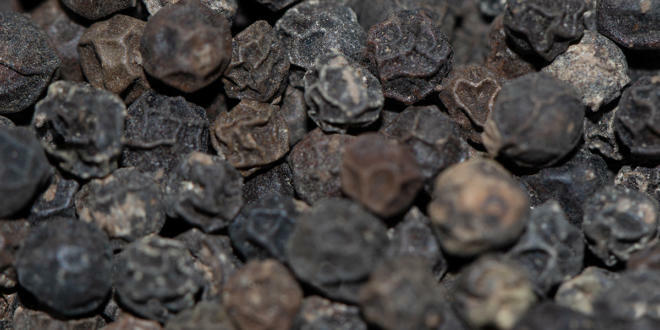 It takes about eight to nine months for the black pepper to develop its typical berry stalls. The harvest is purely manual. The panicles are collected in large baskets. The berries are separated from the panicles directly on site and transported to the factory on zebu carts. A Malagasy farmer can harvest from a healthy pepper vine for about 30 years. The exact time of harvest and the further processing determine the colour and variety of the spice pepper. The first berries are harvested around August. 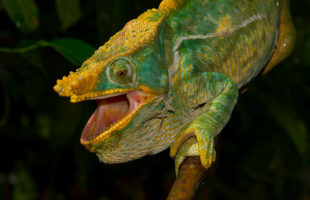 If the green, i.e. completely unripe, pepper berries are harvested, the green pepper of the same name is obtained by freeze-drying or brining. 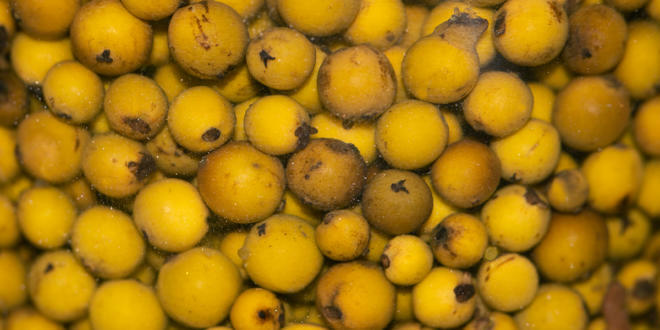 If the green berries are instead dried in the sun on tarpaulins – whereby half ripe yellow berries can also be used here – the typical black pepper with its wrinkly surface is obtained. The ripe berries of the black pepper are bright red. 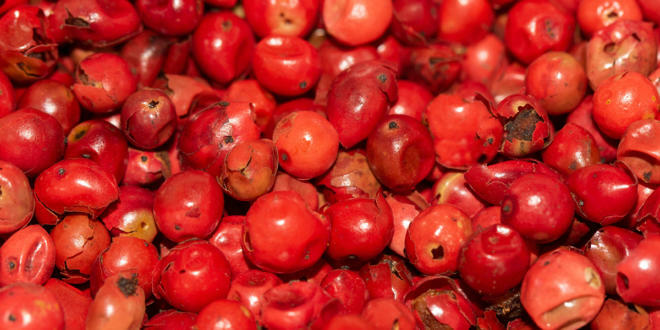 They can be freshly harvested in brine and sold directly as red pepper, less often the red berries are freeze-dried and thus offered for sale. 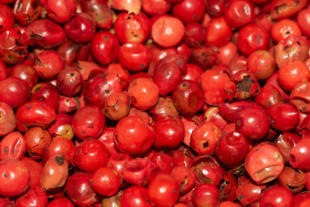 Alternatively, it is possible to soak the ripe pepper berries in water for about two weeks until the skin rots and separates from the grains. The peel and peppercorns are separated from each other by hand by factory workers, and the grains are then dried in the sun. The finished product is the so-called white pepper. Madagascar is known worldwide in Michelin-starred kitchens for a very special plant, similar to real pepper, which can only be found on the red island and nowhere else. 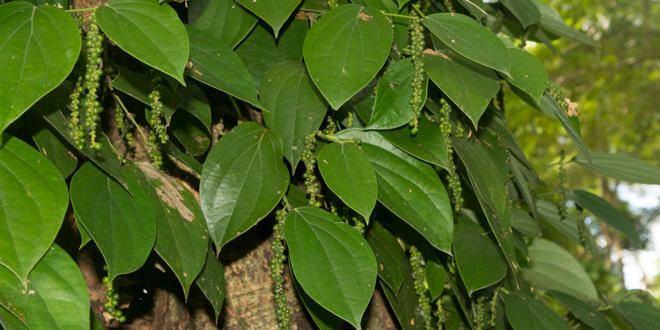 The Perifery plant (Piper borbonense) grows wild in the rainforests of the east coast of Madagascar. The wild growth without cultivation efforts means, besides difficult finding, that the berries are found in heights of ten to 20 meters, which makes the harvest more difficult and pushes up the price of the wild pepper. The wild pepper berries are harvested by Madagascans who have handed down the locations of the plants in their families over generations. If the berries are separated from the ears, they are spread out on large tarpaulins in the sun to dry. When they are brought to the market after a few months, the pepper is brown and, unlike the real pepper, has a small stalk. It is sold under the name Voatsiperifery, which means “berries of the Perifery plant”. 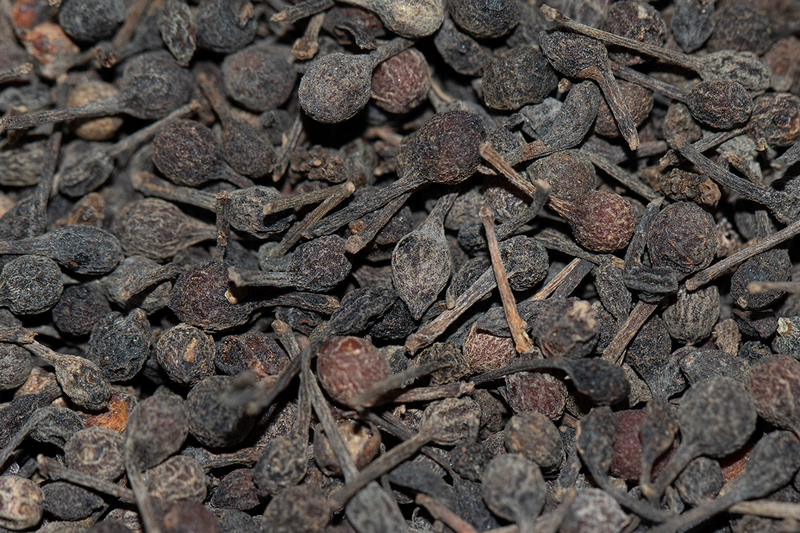 The taste of wild pepper is somewhat milder than black pepper and clearly more aromatic. For the purchase of pepper directly on Madagascar there are spice markets almost everywhere, the best known is the Bazary Be in Toamasina (Tamatave) on the east coast. 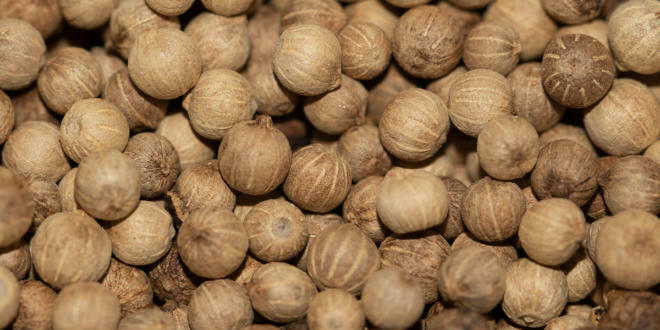 It is recommended to always buy peppercorns instead of ground pepper and to grind the grains fresh before eating them. Otherwise the pepper loses its aroma and becomes musty. In addition, pepper is always only added to a dish at the end of cooking, otherwise it can taste bitter. Worldwide, around 200,000 tons of pepper are produced and marketed annually. 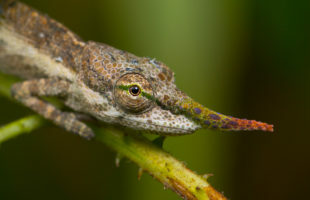 Madagascar accounts for just 1% of this, a little more or less depending on the year of harvest. But pepper from the island in the Indian Ocean can easily keep up with the rest of the world – perhaps not in terms of quantity, but in terms of quality.